So you’ve had this hot love affair with a Cancer man and now he’s acting like he doesn’t even know you. Even if he does reach out; he seems to be somewhere else in his mind. What is going on with him? Why was he so hot and now suddenly so detached? Keep reading for some information you may need to know as well as what you should possibly do. As is with the case for most people; if you move too quickly; you’re likely to end up figuring out that you’re not in love; you’re in infatuation. Cancer man is a romantic and it’s easy for him to “fall in love”. The problem is; he may not actually be in love. He feels something new, wonderful, tempting, and enjoyable. This makes him want to dance circles with his new partner into the night. Once he starts to get to know this partner he jumped in so quickly with; he’ll start to see that maybe she isn’t all that he thought she was or that she’s just different. This can either lead to deeper love or it could lead to fears. His fears of “maybe I’m not good enough” or “she’s not what I’m looking for” steps onto the scene and it makes him start to retreat into his shell. He knows that he was too hasty and yet he isn’t sure how to handle it. While he’s trying to figure it out; he’s going to clam up, stop being as affectionate, perhaps stops trying to make plans, or says things that indicates he’s unhappy with his life. He may not be direct as far as not happy with you. Whatever his motive if it’s fear or if it’s regret for not having taken it slowly; he’ll not know how to cope with what he’s done nor whether he wants to continue with it or breaking up. 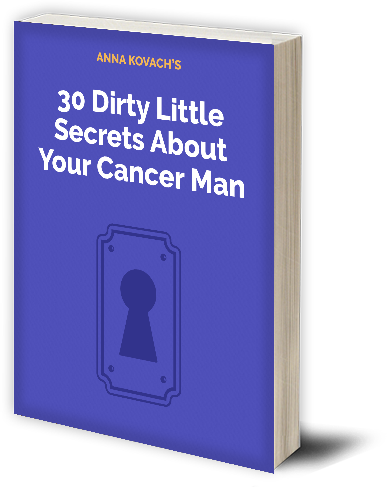 Though a Cancer man can get caught up romancing a woman; he can also realize what he’s doing is probably not the right thing if he knows he won’t commit to this person. Many Cancer men are players until they’re ready to settle down. Therefore they’ll go ahead and charm as many women as they can. The problem with this is that the women become more invested in him than he is in them. When he realizes that is going on; he’ll sort of freak out and in attempt to not hurt anyone; he’ll just decide to back down or out. He’s not the best at being forthcoming or honest with what he’s really doing. If you find that he was laying it on thick and then suddenly ghosts you; it’s possible that he was just trying to see what you were like and what he could get from you then moved on. This particularly happens if you dive into bed with him right away. Beware, Cancer men are very hard to resist in the bedroom. They’re genius when it comes to seducing a woman. When a Cancer man loves you truly; he will stick around and not give you the “cold shoulder”. That’s how you can tell if he wants you or if he is only in it temporarily; if it all. I hate to even go here but it can and does happen with the Cancer man. He’s always on the lookout for “the one”. Even when he has her; he often doesn’t really 100% realize it. He’s so busy looking everywhere else that he doesn’t realize that “the one” is someone he chooses to be. He’s looking for specific qualities and unless he feels 100% committed to someone; his eyes are still checking out other women. Some Cancer men will even go through the trouble of having an affair if they think someone else may be what he’s looking for. Naturally 9 times out of 10; they aren’t and so they try begging their way back in with their partner. They realize that the grass is NOT greener on the other side. His partner however; is now left trying to figure out if she should give him another chance or not. It’s different in every situation but still not a fun situation to be in. If your Cancer guy has found someone else he is thinking may be the right one for him; it certainly will make him shut himself off from you. This includes the standard, no calls, no texts, no social media, etc. It could be that your Cancer man has been deeply wounded before and so he’s overly cautious. He falls in love, he becomes terrified, he starts to feel safe and good then he freaks out again. This could go on multiple times before he finally heals what ails him then is able to move on as well as forward with the partner he’s with. So if you noticed he’s like a yo-yo with you; it may be past baggage bringing him down. If he keeps in contact with you; you may want to talk to him and tell him that you’re there for him. When he tries to ghost you; tell him how you feel about it, tell him how you feel about him and what you want in the relationship. Ask him how he’s feeling about you, ask him what you can do to help ease his pain, and what he sees happening with your future together. It’s always best to open up and be honest with each other. Cancer men want a secure future with someone. They are filled with fear even though they may seem confident and sure of themselves. They are fantastic actors and why they’re so good at charming. If you KNOW he feels for you, make sure that he really wants to be with you by asking him. Don’t let yourself hang in limbo! I hope this helps you figure out what you want and how to deal with your Cancer man situation.